A sketch done previously in 2012. Read about it here. 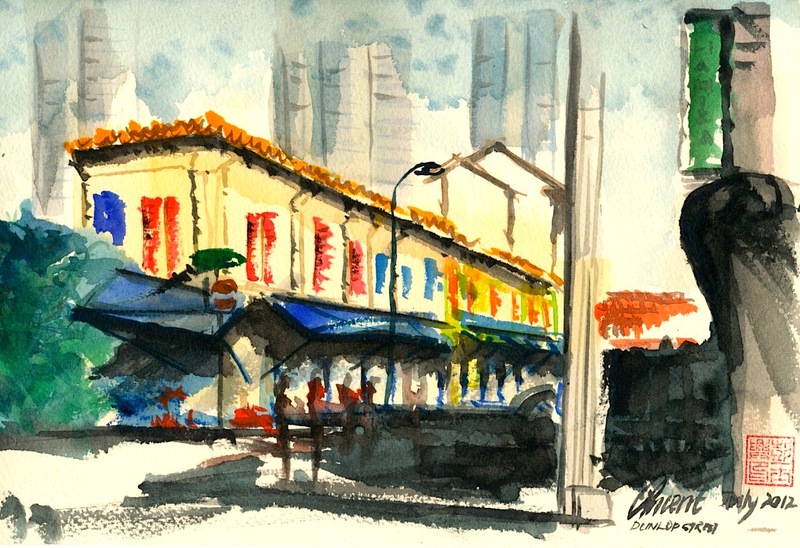 On 8 March, the Urban Sketchers Singapore, in conjunction with Epigram Books, organised a sketchwalk to Little India. This is part of the on going “We ♥ Our Neighbourhood” project. Already familiar with the drift of sketching, most of us went off on our own searching for the landmarks and places we wanted to include in our sketches. Despite residing near the area, I am not familiar with the little historical town. 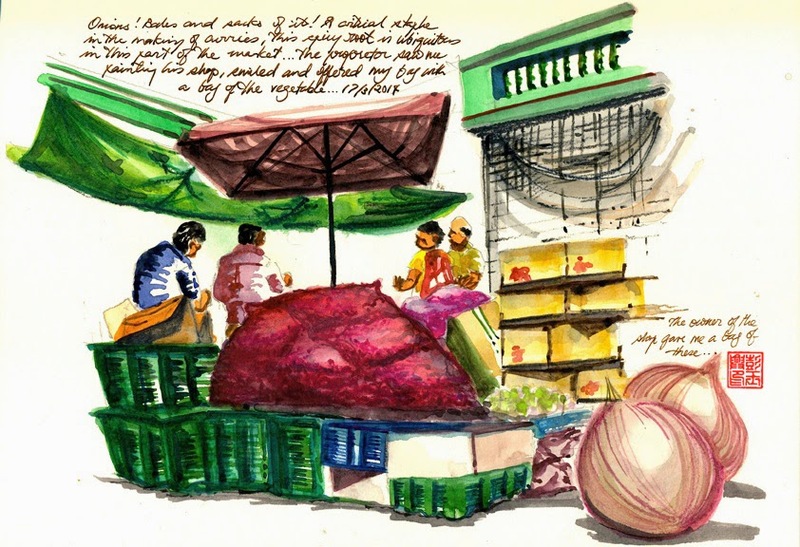 So, to me, it was as much an expedition as it was a sketchwalk for me. 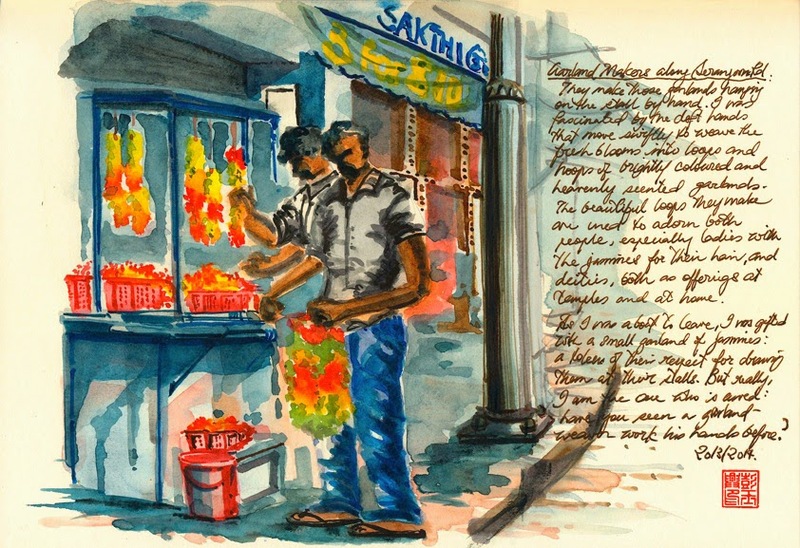 With my rucksack of sketching tools and materials, I felt like a tourist: the sights, the sounds and the smells, especially the smells, were all at once strange yet vaguely familiar: like stepping into a land in a fairy book that you’ve only ever read about but never been… every bit a traveller in a strange place. 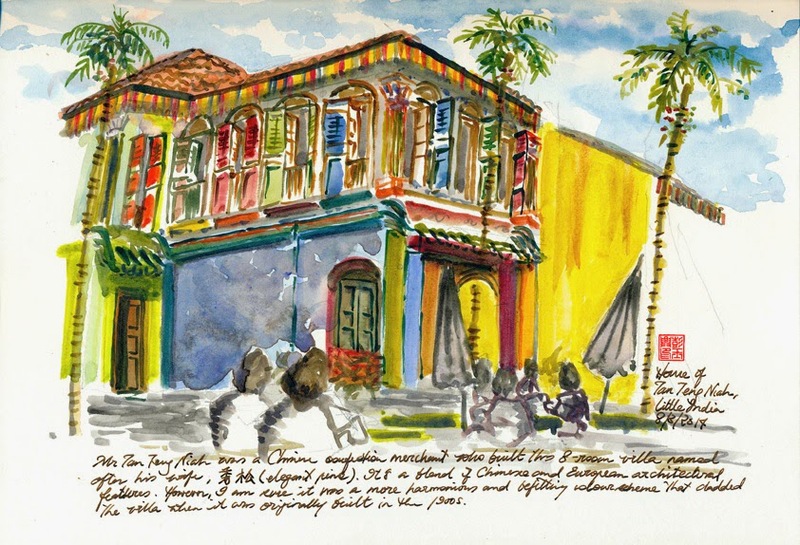 After negotiating the winding alleys and perpetually busy streets with vehicles plying them, I found myself in the courtyard of a gaudy restored building – the villa of Tan Teng Niah, a confectionary merchant who once lived here. The phantasmagorically coloured building was once the 8-room villa of the merchant. Named after his wife 秀松 and possibly dedicated to her as well, I believe the villa once sported a colour scheme more befitting of it namesake: elegant pine – graceful and enduring. Capturing the cacophonous parade of bizarre colours and trapped in the drought heat took its toll on me: I could only complete one sketch that day. 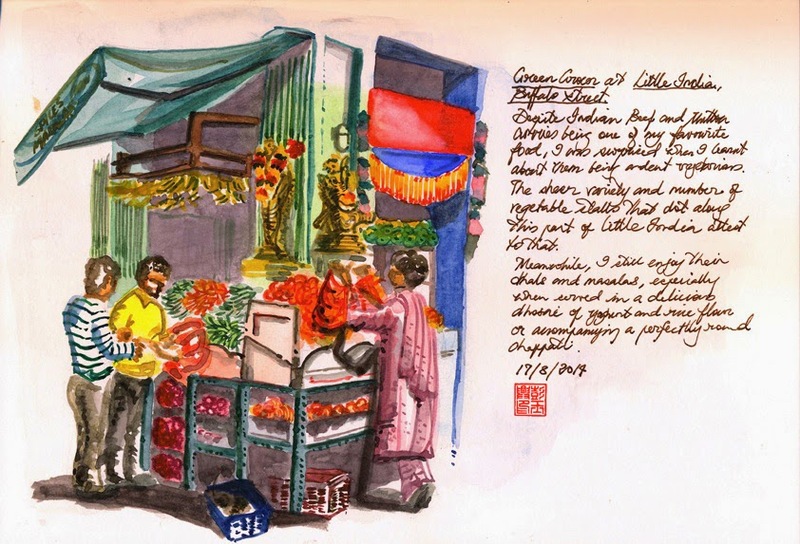 The rest of the outing, before the final show-and-tell was engaged in some personal expedition of the little heritage town, once the enclave of migrant workers from South India. My guess is, looking at the people and places here, little much has changed since then. Perhaps its my upbringing, or what my learning has imbued, as I ventured the narrow, the winding, the streets and the alleys, I realised that one of the main reason why this heritage site has gone beyond mere survival but actually THRIVE, is not the beautifully restored buildings nor is it the rich historical context in which it is set. If those were the reasons Tanjong Pagar and other heritage sites would be rolling in the dole by the mere mention of their street names. 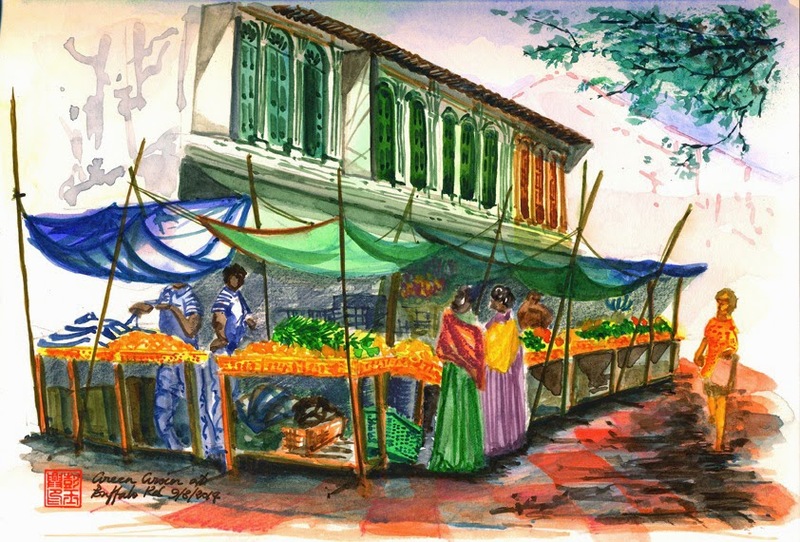 For Little India, it really is the activity and the community it involves that creates the spirit of the place, what has been around since the very beginning: the traditional commerce, the people who speak the native tongues and work the trades, the food, the culture, the customs: they have always been here. There is no hothousing, no artificially inseminated life; day, night or otherwise. This little town named after the subcontinent had always been, it had never stopped being… itself. Making an Indian flower garland. As I left that place that day, I made a mental note to myself: when I come back to capture the place on my sketchbook, it’s not going to be buildings and signboards and/or other inanimate, structural entities that I am going to capture. Instead, it’s going to be human activities, traditional trades and other scenes that are native to the place that I am going to journal, pictorially.